On the date of obtaining the GST registration, persons carrying on regular business would be holding stock of inputs, capital goods and finished goods at their place of business. The GST paid on such goods purchased cannot be claimed as Input Tax Credit (ITC) before the date of obtaining GST registration. 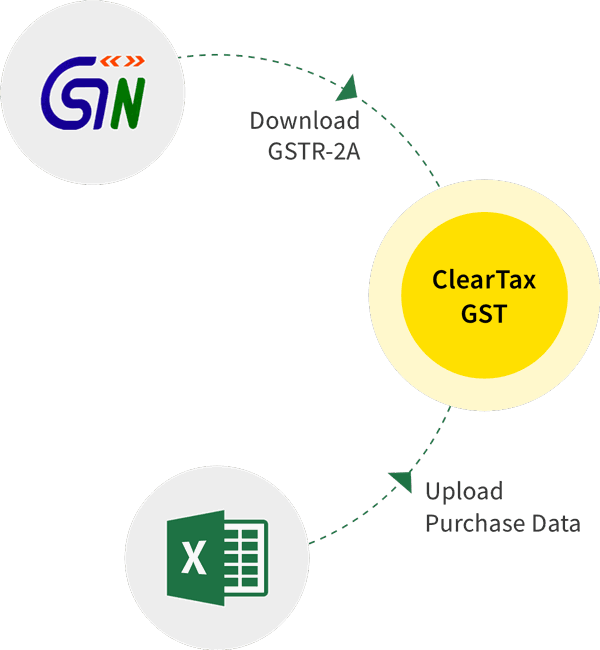 Only after obtaining the GST registration, taxpayers can avail input tax credit of GST paid on such inputs, capital goods and inputs in finished goods lying in stock, from the effective date of obtaining registration. Form GST – ITC 01 is a declaration form filed on GST portal for claiming the input tax credit by taxpayers newly registered under GST. Filing of this form is mandatory to claim ITC on such stock. It should be noted that ITC cannot be claimed if the person fails to file Form ITC – 01. Input tax credit in respect of inputs held in stock on the cut-off date. Input tax credit in respect of inputs contained in semi-finished goods on the cut-off date. Input tax credit in respect of inputs contained in finished goods on the cut-off date. Input tax credit in respect of capital goods on the cut-off date. Applies only in cases where a composition dealer opts out of the composition scheme and where exempted supply becomes taxable supply. Form ITC – 01 is required to be filed within 30 days of the person become eligible to claim ITC i.e. 30 days from grant of registration or opting out of composition scheme. For example, Mr A, a trader opts for voluntary registration on 29 December 2018. Mr A would be eligible to claim ITC of inputs held in stock, inputs in semi-finished goods and finished goods lying in stock and capital goods with him as on 28 December 2018. Know what input tax credits can be claimed. For example, the ITC in respect of services cannot be claimed in Form ITC 01. ITC in respect of capital goods can only be claimed in case composition dealer opts out of composition scheme and where exempted supply becomes taxable supply. Invoice wise Details of ITC on purchases as on the cut-off date should be available. Form ITC 01 should be filed within 30 days of the date of registration/migration to a regular scheme. Invoices up to one year old can be claimed in case of inputs and up to five years in case of capital goods. If the ITC claim is more than INR 2 lakhs, Chartered Accountant certificate or Cost Accountant certificate must be uploaded. 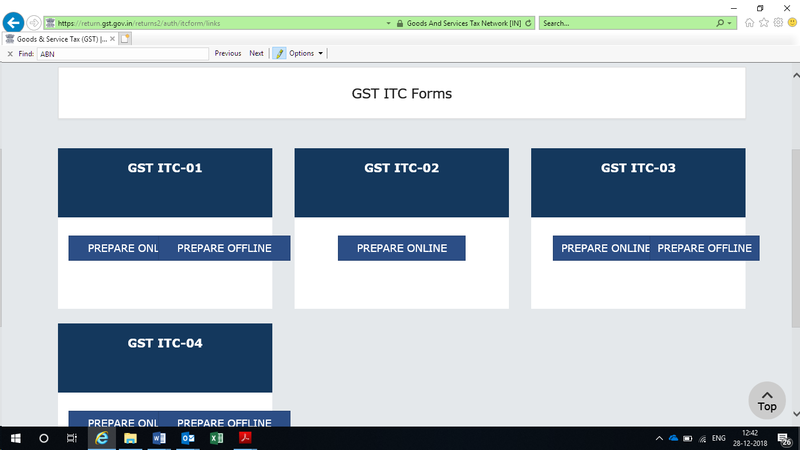 Step-1: Login to GST portal. 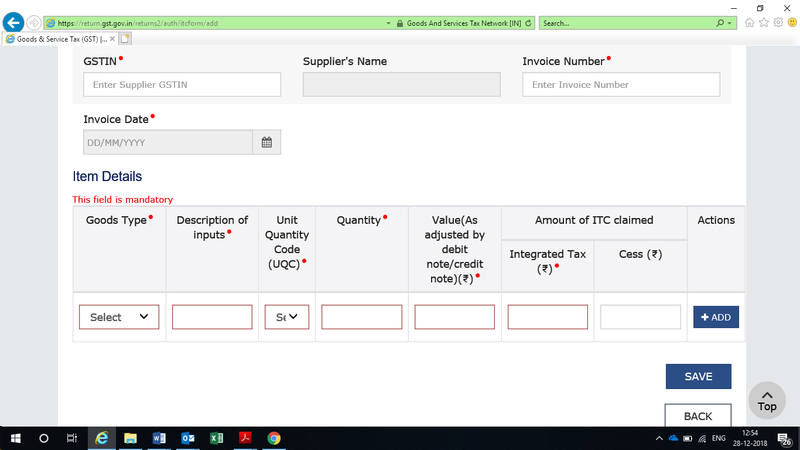 Step-2: Click on Services tab > Returns > ITC forms > ITC 01. Click ‘Prepare online’ or ‘Prepare offline’ button. Select the clause and sub-clause of Section 18 under which claim is made in ‘Claim made under’ tab. The fields remain the same in each of the options mentioned above. Note: For claims made under Sec. 18(1)(d), a date on which goods become taxable must also be entered. Click on ‘Add’ button to continue adding more invoices or Click on ‘Save button’ to proceed to submit. Note that no modification is allowed after status turns submitted or you click on Proceed. Step-5: Upload CA certificate, if applicable. Date of issuance of the certificate. Once the form is successfully submitted, Click on ‘File using DSC’ or File using EVC’ button and select the authorized signatory from the drop-down list to file using DSC or EVC. Once filed, ARN is generated and sent to the taxpayer via SMS or Email. The status of GST ITC 01 is changed to ‘Filed’. The ITC claimed in Form ITC 01 is then made available in the electronic credit ledger. 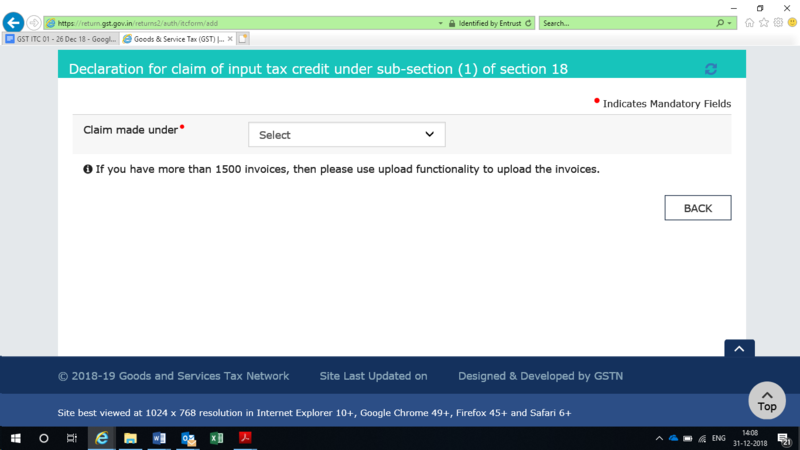 How to claim ITC under the new proposed GST return filing system ?